Here are a couple of easy sandwiches to make. One uses baked tofu and the other uses tempeh. Toast the bread.Cut the tofu in half, so you have two thin square layers. 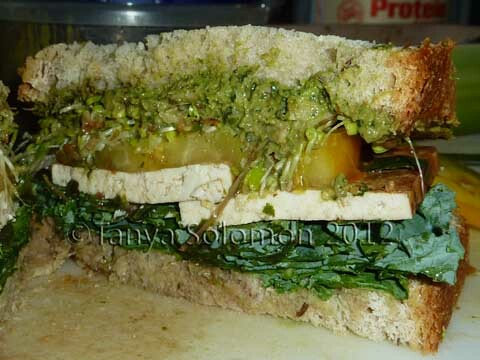 Layer onto the bread: the kale leaves, then the 2 slices of tofu, then the tomato and sprouts. On the top slice of bread, spread a thick layer of pesto, then top the sandwich and you're done! Put a little water in a small pan and add the thin square of tempeh. Add the garlic powder, onion powder, salt, and pepper. Cook on medium heat until slightly browned, then turn over and do the same. You may need to add a little bit of water here and there to keep it from burning. When the tempeh is browned, add the sauerkraut next to it in the pan and heat through. Toast the bread. Mix together the mayo, ketchup, and relish in a small bowl. On top of one piece of toast, layer half the sauce, then slide the tempeh on top and put sauerkraut on top of that. 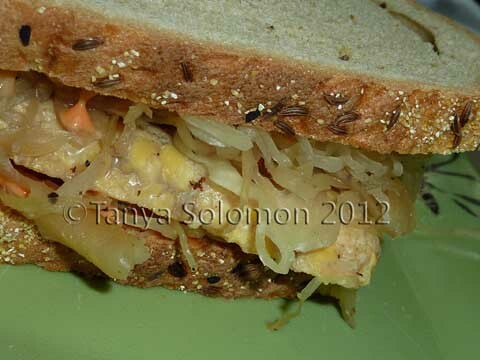 Then spread the rest of the sauce on top of the sauerkraut and top with the other slice of toast. Enjoy! I've been curious about the savory tofu at Trader Joes. I'm definitely going to try it soon. that first sandwich looks amazing. well done!